Doulas Lower C-Section Rates? You Bet We Do! Did you know that an Obstetrician is not your only choice to follow you and your baby through pregnancy and birth? Let’s talk about what to look for so you feel cared for and supported through your pregnancy. Let’s talk about where these providers deliver and how that can affect your birth. Let’s talk about YOUR goals for your pregnancy and how that can be effected by your provider. The most important thing I want you to know is that YOU ARE NOT CHAINED TO YOUR PROVIDER. If, at any time, you feel like you are not being listened to, or supported, you can transfer care (usually) up to 36 weeks pregnant. Thanks for taking the time to watch. I am honored to walk through this time with you. Did you get a pink line? A plus sign? A call from your doctor telling you that you are, indeed, pregnant? This news can bring up a myriad of emotions. Guess what? That is ok. It is ok to be just where you are, right now. Don’t shy away from the tough feelings or the hard questions. You are strong enough to do this! Thank you for allowing me to walk with you through these first few moments. Being interviewed by Chuck Leonard for Central Valley Buzz. Chatting about doulas and how we help birthing families in Fresno. I got to do something really fun! 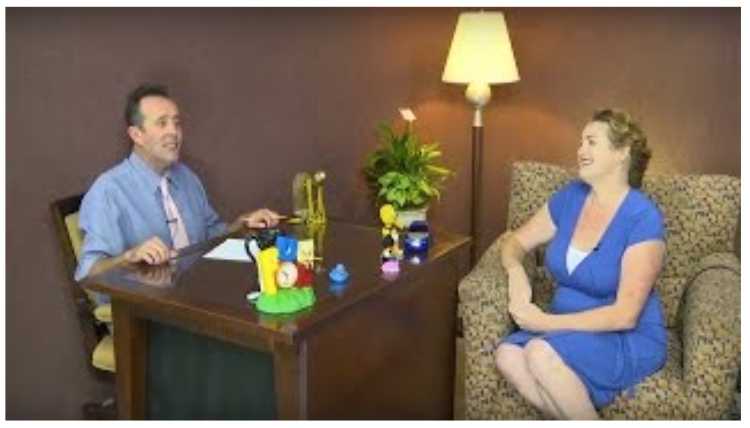 I was able to go on a local show and talk about what a doula does, and how we can impact the local birthing families in Fresno, and the wider Central Valley. It’s broken up into two eight minute segments. Take a few minutes to get to know me and know a bit more about why I LOVE what I do! Click on the links below for the videos. I want to apologize to you, now. I’ll probably be late to that meeting/playdate/hangout/party that I just agreed to. It has nothing to do with you. As a matter of fact, if I’ve agreed to step out of my baby cave to come and see you for any reason, it is because I either love you very much, or value your services dearly. I know that this will not excuse me from being considered rude by several of you. I know that many of you have never struggled with tardiness and can not relate, but I need you to see my heart and not a clock, for a brief moment. My youngest son is six weeks old. He is an adorable, chubby, happy little time sucker. Thankfully, he is my fourth child, so I had previous experience with the ‘time vortex’ of new motherhood. It can be disorienting for most, and downright frustrating for some new moms, but I kind of relish it. Time is no longer dictated by a clock for me. In fact, I rarely look at the clock, anymore. My rhythm is set by feedings, diaper changes, bouncing and cuddling, staring at my baby, changing clothes after being puked on, and trying to figure out where I can safely put him when I have to pee. He is brand new to this world, and cannot yet check his phone for the time, so we rock-and-roll all night, and party everyday. He will only be like this for the blink of an eye, and I get the honor of bearing witness to this stage in his life. This is why I am reluctant to make plans. It is also why my house is a mess and I always kinda smell funny. If we’ve made plans, know that it is because you are dearly loved. So, when my phone alerts me that we are getting together in two hours, please forgive the fact that I may audibly sigh (or curse under my breath). It has nothing to do with you. I’ll start the countdown with the kids. “In two hours, we have to leave. Please brush your teeth and put on your clothes.” They will happily agree and run off to their room to do neither of those things. I will make an attempt at putting the baby down so I can jump in the shower long enough to put soap on the most crucial places, and hope that I have enough time to rinse it all off again before someone is screaming bloody murder for me. I’ll jump out of the shower and put on any clothes that are clean and somewhat appropriate for the occasion. By this, I mean that I will throw on the nearest pair of yoga pants and my least stained t-shirt (you’re welcome). I will break up several fights and listen to the constant din of Spongebob Squarepants as I run around the house feeding, watering, cleaning, hugging my children, and trying to listen to another knock-knock joke from my 6-year-old. Then I’ll remember the load of laundry that never made it to the dryer, so I will run out and rewash that load. I’ll attempt hair and make-up. Let’s face it, concealer and I are best buds. Nope, baby is hungry. Crap. How long has it been since anyone has eaten? As soon as I sit down to nurse the barrage of requests for various foods and beverages begin. Not when I am able to have two hands to meet these requests, but when I am supporting a small human who is taking MY calories to nourish themselves. I will attempt to open cheese sticks and cut apples one-handed, or I may just end up putting a box of goldfish on the table and letting them fight it out. Time to burp the baby. He just threw up on me again. Where is my second cleanest shirt? “Boys, the baby is happy on the floor. Don’t touch him!” Back to the makeup. Halfway through the mascara the baby is crying. 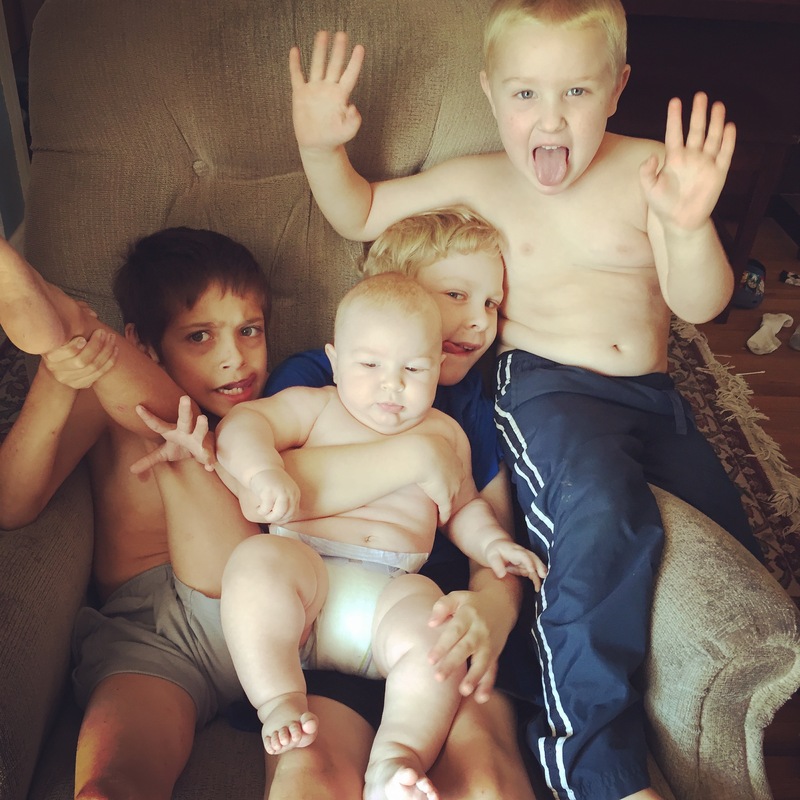 I look out in the living room and see that all 3 of the big boys have surrounded the baby and are taking turns poking him (they say they are tickling him). “Get back in the kitchen and eat your goldfish!” I attempt to hold the baby and complete my ‘day look’ while the boys are in the kitchen. I catch a glimpse of the clock. We have to leave in 30 minutes. Seriously!? Ok, put diapers and wipes in the diaper bag. I ran out yesterday and do not want to repeat that situation. “Mom, I need your help in the kitchen. Boy 3 spilled milk all over the floor.” Quick! Get a towel before it runs down into the floor vent, again! As I am finishing up washing my hands, the baby begins to cry again. I emerge into the living room and see the other two playing an aggressive game of peek-a-boo. I rescue the baby and tell the boys it is time to find their shoes. Dishes in the sink. Make sure I have all the baby essentials. Change his diaper.Grab two spit rags. Only 15 minutes until we need to be there. Baby in the car seat. I take a glance in his room and both are laying on the floor right by the door. “Found them!” I help him into his clothes and lock up the house. Shoot! I never did anything with my hair! Did I switch the laundry? Nope! Unlock the house and put the laundry in the dryer. Re-lock. Get to the car and buckle all kids. Sit in driver’s seat and turn on the car. Crap! Five minutes until I’m supposed to be there! I’ll just text you and let you know that I’m on my way. I arrive at least 5 minutes late looking frazzled and possibly dragging one or two kids with me. You are a radiant beam of gorgeous light in my life. Clothes that match, hair done, and makeup on. I feel every bit the hot mess that I am, but I tolerate it because I love you. Thank you for your grace in allowing me a little wiggle room. I may be late, but I’m fun! P.S. If you are ever waiting for me at a coffee shop, I take a Chai Latte with Soy or Almond Milk because the baby is sensitive to dairy. Another study regarding doulas and their relationship to mothers avoiding medically unnecessary C-Sections was recently published. The study compared mothers who hired doulas with mothers who either wanted doulas and were unable to hire one, mothers who were not familiar with doula work (and therefore did not know they could hire one), and mothers who did not wish to hire a doula as part of their birth team. The study looked at their birth outcomes and overwhelmingly concluded that, statistically, women who knew what doulas were and were able to hire one greatly reduced their C-Section rate. Wonderful news for most of us! My heart is breaking for the 27% of women who wanted a doula, but were unable to hire one. Most were low-income families who did not have the resources to pay for a doula’s services. This article suggests something that most of us have been shouting from the rooftops for years, WHY AREN’T INSURANCE COMPANIES COVERING DOULA SERVICES!? Some do. Some cover up to 70% of a doula’s fee. Some HSA accounts will let you use your funds for doula services. Why not ALL? Why not Medicaid? If there was a $1000.00 (average doula rate in the U.S.) pill that decreased a woman’s odds of having a C-Section by 60% with no negative side effects and decades of studies behind it, I would consider it criminal not to administer that medication. You decrease what insurance companies pay on average for a birth by $9000.00 if doulas were covered by insurance companies. Nine THOUSAND dollars, per cesarean birth. One of the reasons why it has not been DEMANDED that women have access to quality doula services can be found in the comments section of the article. If all a doula did was whisper sweet nothings in their client’s ear and give her a little back rub, then, by all means, this gentleman would be correct. We are skilled members of the birth team. We educate our clients, we motivate our clients, we physically move our clients. We know, operate in, and promote normal birth. We can read our clients, and help them to break through their walls, because we walk the path of labor WITH them. No one is questioning that most of the medical staff want the best for moms and babies, but we, as doulas want the best for THIS mom and THIS baby, and we are going to work our tails off to make sure that they get their best outcome. My hope is that insurance companies will see the financial benefits, promptly, so that any woman who desires has access to doula services. I had a fantastic meeting, this morning! I met with a local Non-Profit, exploring ways in which Birthworkers can effectively support women in need in our area. The Director and I had a wonderful chat about what her organization does. I was floored with the love, skill, and resources this group makes available to our community. She then asked me what services I, and other doulas in our area provide. I told her about helping women to become educated in their pregnancy and birth choices. I spoke about the importance of goals, and helping women utilize the right tools to reach their goals. We talked about unwavering support for mothers physically and emotionally as they make preparations, birth their babies, and transition into being a family. I told her about supporting families in their home during those critical and exhausting first three months of baby’s life. It is so rewarding to be able to offer breastfeeding support, assisting with newborn care, scheduling and organizational help, keeping baby related items clean and tidy, preparing healthy snacks, taking over baby duty while parents get some quality rest or time with their other children, and helping mama take care of herself during that critical Fourth Trimester. I told her, now that she knows, it’s her job to let other mamas know, so they aren’t saying the same thing in five or ten years. Now YOU know about Doulas, too. I happen to know a few who are amazing! I know it is strange. I know it is a little awkward to be meeting someone for the first time who may end up massaging your back as you labor. I know that finding the right doula for your labor support can make a huge impact on how you feel about your birth experience. I know that you and your partner have a lot of questions about what a doula does and why you need one. I know that you are probably a big ball of anxiety and excitement that this baby will be making it’s way into your world soon. Like, reeeeaaaaaallllllly soon! I also know that we are going to get through this together! I want you to take a deep breath. I am here to help. We will start off with introductions. You tell me a bit about yourselves and I’ll do the same. I will ask you about your family, your pregnancy, what you are thinking about for your birth, and what concerns you are dealing with. We will not be at a loss for words. You have a lot on your mind, and I want to hear everything that is important to you. I may guide our discussion with gentle questions, but I want to HEAR you. I want you to ask your questions, share your worries, and let me get a glimpse into your world. Soon, we will be friends. Honest to goodness friends. You will be comfortable asking me ALL of your questions. We will talk about a whole lot of intimate information, and you will be comfortable doing so because you will know that I truly care about you. When you call me to let me know that it is time, I will be so excited to share this time with you. I may squeal with joy. I will jump out of bed at 3:00 am filled with happiness, because I get to support you as you become a parent. I will tear up and we will hug. I will hold you as you labor, and help you discover how incredibly strong you are. I will breathe with you, and mop your forehead as you push your baby into this world. I will share your joy as you have your first tender moments with your baby, and help you as you figure out how to nurse for the first time. These are the moments we will get to share. Although, I know it may be strange to meet me for the first time, all amazing relationships have to start somewhere. I’ll look forward to meeting you, soon.